Why are you called “Penance RPG”? We did not intend to start an actualplay podcast, or indeed any podcast. Way back in the depths of mid 2016, some folk from a small World of Warcraft guild called “Penance” decided they should run “some form of RPG” over the guilds teamspeak server. That was to keep us sane during the many, many months of running the same raid content. This originally was going to be a ready-made engine such as Dungeons & Dragons, but to significantly reduce the need to buy any books for creating characters, spells, etc. Nikoli decided to rebuild his previously stripped down cyberpunk RPG engine into a fantasy RPG setting. This uses minimal rules for creation and needs minimal prior knowledge to join. This was a much easier way to bring in everyone who was interested in at low (or no) cost. We did look at using roll20 and similar online map websites to help play the game. Nikoli experimented with software and decided it would be better as a “theatre of the mind” style RPG. The Teamspeak server allowed recording directly and a dice rolling add-on let everyone roll in the chat box. So we started recording in July 2016, originally to be something to amuse the others in the guild. However, around 20 episodes into recording something seemed to click. Ellie, the music student, wondered if she could edit the original episodes, add some backing music that she had written, and release them properly as a podcast, to see how the interest outside the guild went… and that’s how we came to be on Soundcloud…quickly moving to Libsyn and becoming active on Twitter, Facebook, Tumblr and recently Instagram. Additionally, we now record via Discord which allows us to make servers for each cast. Our motto of “Stay ambitious, even if you think you are rubbish” comes from that WoW guild’s motto of “Ambitious but Rubbish but Lucky”. We created this in reference to our social-focused approach to end-game content rather than pushing for speed or completion. It also works well for the anarchic feel that drives an enjoyable actualplay listening experience. So how does the RPG system differ from others? 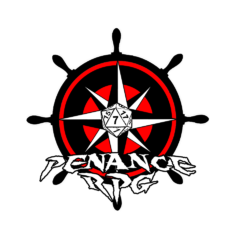 The Penance RPG system allows for complete free-reign for its players to choose how they want to deal with issues they face. If they want to use some form of elaborate trickery to get past a guard or set a building ablaze they can. However, for every action there is a consequence, and sometimes this sense of karma can come back to bite them. Hard. We feel that telling a story with the characters and allowing them to grow and change makes for a better experience. The story and characters develop and weave together organically. Our storytelling is collaborative and so every character action is important. We also have a varying number of characters per recorded episode, typically between 4-8 Characters plus the DM every week. This depends who is free to record the episode that week. The characters that aren’t present are said to be “asleep on the cart” or “in the bag of holding” and will return in future weeks. This allows for a greater variety and keeps each episode feeling fresh and dynamic. Largely, any system or campaign we adapt to our own system is run largely the same as our homebrew engine. In doing so, we attempt to keep the feel of the original – this has included (so far) Dungeons & Dragons 5e and Call of Cthulhu. In addition, we enjoy and take inspiration from many other forms of gaming and wider entertainment. Board games in particular have a place close to our hearts. How much do you edit or censor out of each episode? Very little, We endeavour with each episode to leave as much of the base content as possible, but it is sometimes necessary to remove elongated tangents or repetition. As a rule, we do not censor the content in the podcast – we feel that being able to explore some adult themes in storytelling and the subsequent consequences to the player interaction creates a more organic story overall. So when’s the next Episode out? Currently, our new series – Plummet: Falling In The Dark – is released on our standard schedule of (very early on) Sunday morning, GMT. Most of the time we also have a a mid-week release of a separate campaign on Wednesdays. The archives for all our content can be found under the Shows and Archives options in the menu above. For any specials releases or deviations from this see our Twitter. So you write your own music? In addition, much of the art and graphic design we use is by members of the cast, including the logos by Jon Moore (Stilgar, Kubroq) and additional graphics by Adam Johnston (Ozmand, Igneous) of Pretending With Dice. So what has changed since you started? Originally we started with 8 folks all from the guild. This dropped over time as some of the starting cast decided that they would rather not continue their adventure. To make up for this we added new folks. At the start of season 2 we added Belry (played by Ben) and at the start of Season 3 we added Andreadina (played by Rebecca). At the beginning of Season 5, we were joined by Ora Dulce (played by Daniel, often referred to as Lenida) and Rivane departed. For each of our subsequent series, including the current ones, we’ve have a different cast for each project. This has several advantages – we get to play with more awesome people, have more diversity in our cast and helps ensure each campaign has its own feel. Our first Halloween series was hugely enlightening as to how we can expand to include different styles and locations, despite some painful time zone differences. There have also been a few changes on the technology side; we have decided to upgrade our podcast hosting package to one from Libsyn. Also we’ve recently had to bid farewell to our original Teamspeak server as the hosting site has closed down. From Season 4 of our original series onwards, we have been playing online over Discord and recording and editing on Audacity. In addition, our GM (Nikoli) and several of the cast now have Blue Snowball mics. Some combination of these, plus many more hours of practice at editing, have improved our audio quality and we feel it has added to the immersive, storytelling aspect of our tales. Do you have a Patreon or Ko-Fi? Yes, we do (as of March 2018), you can find our Patreon here. We are very grateful for all your support and are starting to expand into more projects. Many heartfelt thanks to our Patrons. Tiers start from just $1 and give access to stat blocks for Penance Friends & Foes, as well as other interesting rewards.